Sie haben eine Frage zum Mentari Cenang Inn? Das im Jahr 2013 errichtete Mentari Cenang Inn ist eine ausgeprägte Ergänzung des Stadtbilds von Langkawi - und eine kluge Wahl für Reisende noch dazu. Nur vom Flughafen entfernt, lässt sich die 1-Sterne-Unterkunft nach der Landung einfach erreichen. Als Gast genießen Sie von hier aus die wichtigsten Attraktionen der Stadt (Alun-Alun Spa, Yoga Now Malaysia, Mc Donald's) und weitere Vorteile. Der exzellente Service und die herausragenden Einrichtungen des Mentari Cenang Inn sorgen für einen unvergesslichen Aufenthalt. Die Unterkunft bietet zahlreiche Einrichtungen vor Ort, die selbst dem anspruchsvollsten Gast gerecht werden. Erleben Sie qualitativ hochwertige Zimmereinrichtungen einschließlich Flachbild-TV, Wäscheständer, Bettwäsche, Spiegel, Sofa und mehr, die Ihnen nach einem langen Tag das Abschalten leicht machen. Die Freizeiteinrichtungen der Unterkunft (Garten usw.) sind zum Ausspannen bestens geeignet. Das Mentari Cenang Inn garantiert einen entspannten und komfortablen Aufenthalt in Langkawi - eine clevere Wahl. Das Guesthouse ist nicht ganz zentral im Ort. Man läuft bis zum Strand etwa 15min 1,5km. Dafür hat man seine Ruhe und wohnt etwas ländlich. Das Zimmer war super sauber und wir hatten zu zweit 2 große Queenbetten. Also genug Platz für alles! Die Klima funktionierte super und der Fan auch. Die Betten waren gemütlich und wir hatten eine gute Nacht. Jedoch waren ein paar Mücken vorhanden, das ist aber das Gegenstück wenn man etwas außerhalb wohnt. Dafür keine Kakerlaken, die es sonst in der City genug gibt. Die Inhaberin war ausnahmslos freundlich und stand mit Rat und Tat zur Seite. Sie zeigte uns den Weg und klärte uns über die Ortschaft auf und gab Tips und Tricks. Wirklich super! Beim Zimmer muss man bedenken, dass das Waschbecken außerhalb des Zimmers ist und nicht im Badezimmer integriert ist. Hat uns aber nicht gestört. Dadurch das im Badezimmer kein Fenster oder Abzug vorhanden ist, gibt es auch schon Schimmelflecken. Für den Preis aber auf jeden Fall in Ordnung. Dazu gab es auch einen Wasserkocher und freies Trinkwasser im Kühlschrank. Für ein paar Euro weniger dann auch ein noch besseres Preis-Leistungsverhältnis und volle Punktzahl. I stayed with my family here for one night, the room is big, clean, comfortable and the staff also very friendly. The location is little bit far from the beach, but it's fine because you can buy all you need near by. The receptionist not always around, I touched the belt so many times when I am going to check out, but no one responded. Hence i put my room key in the receptionist table, hope no one will take it out. The room is quiet, clean and good enough for 4 people of us. However it's located far from the downtown, and at night the road back to the hotel is dark. So that I think I'd prefer the hotel downtown for nice nightlife and shops. Had a great stay, room was spacious, clean and very cosy! Although basic, this was reflected in the great price! Staff were great, would totally recommend to anyone travelling on a budget! 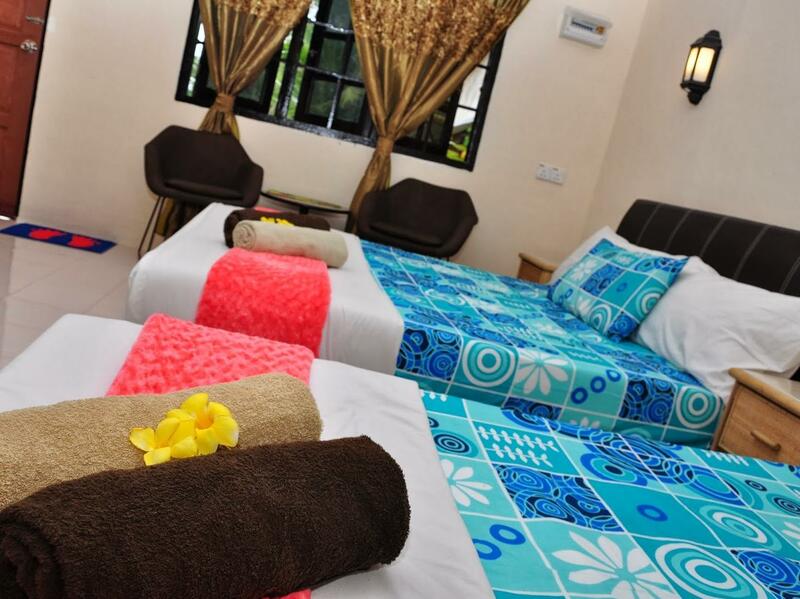 Room is big, clean and has all you need for long or short stay. The bed is very comfortable, and plenty of storage space. Meiza is absolutely lovely and really helpful. It is around a 15 minute walk to Cenang beach front road, Meiza shows you the short cut, it's through lovely countryside and you get to see the local village life, really nice walk. At night coming back we took a taxi each time, only 10 ringitts and better as parts of the road unlit. It's really peaceful and friendly at Mentari Cenang Inn, a great choice, I would highly recommend and very good value. 10/10. It is a little far from the beach and the walk there can be very tiring due to the hot sun. However, the owner is really kind and helpful and offered to send us to the beach when she couldn't get a cab for us. I recommend this place if you are looking for a budget accommodation in Pantai Cenang. 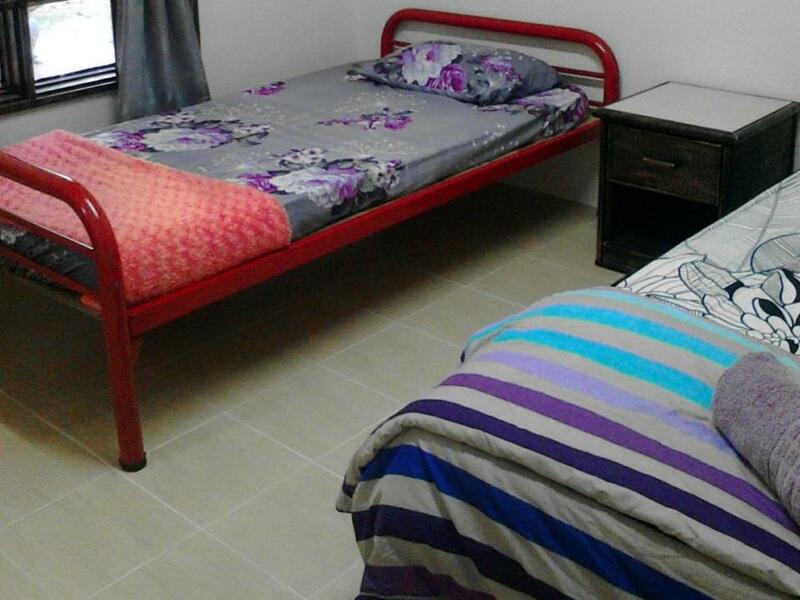 Cutie homestay with large and super clean room. 2 double bed suitable for 4 adult. Great value for money. the owner was very friendly, kind and helpful person. Nearby pantai cenang, easy to find restaurant and many few interesting place. We really enjoy our stay in Langkawi. Sure will come again. Thank you AGODA! The host was extremely helpful during our whole trip in Langkawi. They picked us up that costs about RM 30 instead of us waiting for cab searching for the guest house. On our first day, the host kindly drove us to the town buying a mobile card and renting a scooter for our travel the next few days in Langkawi. The room is surprisingly huge. I was expecting a small room with two single beds. What we got was two king beds and an inside bathroom + warm water. Since we can’t avoid getting wet playing water games, we went home drenched with a ton of clothes waiting to be washed. There are local laundry services available, but you definitely don’t want to spend time going there. The host will be able to help you bring the dirty clothes to the laundry service and even pay for you first. Our stay was perfect thanks to the host, so I highly recommend this place. The owner is very helpfull. A ver peaceful place to be. The room was clean when we arrived and cleaned while we were there. The hotel is out of town but possible to walk and took us 15 mins. The owner is very nice, friendly and happy to arrange tours, etc. The hotel is in a really lovely spot and very peaceful.